Upright, vigorous plant suitable for trellised protected cultivation. 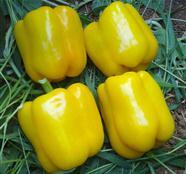 The yellow blocky fruits, are 9 cm in width, 9 cm in length, with a high percent of four-lobed produce. Valentino F1 have thick walls, making it suitable for export. Having high tolerance to TSWV, this variety can perform well year round.